My next big thing is getting a smartphone and I’m really excited about it too. For all of us nerdy folks; I’m being assimilated; resistance is futile. This week I’ve checked out some and have gotten opinions from folks I know that have them; I’m leaning heavily towards a Blackberry Curve. Hopefully I don’t regret being so connected but I’m willing to take that chance now that I’m into social media. So often on the campaign trail I wanted to tweet something or email something on the go and couldn’t. I figure it will make the rides on the T a bit more palatable and productive. Something else that would make my often sleep deprived, temperature challenged life more bearable, a trip to the spa…and guess what? I won a gift card to Ten-X Spa from Kiss108. 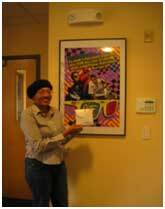 Here’s the photo of me at their office accepting my prize. A massage in the near future is something to look forward too. Hint hint, I highly recommend this as a gift! There was an interesting trip to the vet on Thursday with all three cats! Luckily everyone was relatively healthy but still needed meds; I have the scratches to prove it. That’s something to look forward to; two weeks of administering three medication doses to two cats… Thank God for my neighbor giving me a ride and helping me with them. Honestly, I don’t know how parents with more than one child manage a trip to the doctor’s office! The same day as the trip to the vet, I ended up in “Twitterjail” too many updates/update limit reached and was told to relax for a few hours; it was odd but Twitter thought that I was a spammer. Just the thought of me not tweeting for a few hours made me break out in a sweat! How can that be? I almost resorted to Google Buzz to get my fix! I’m sprung now and will heed the warning next time!